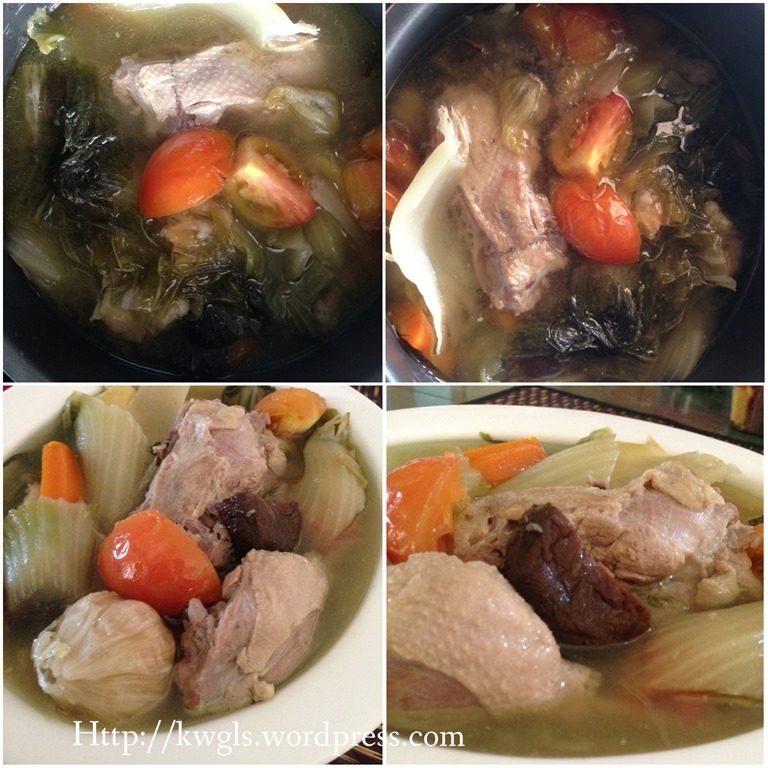 This is a soup dish that I have always craved for it。 It is rather extraordinary as not many Fujian Chinese soup dish are as sour as this dish。 However, it is a well liked dish that most Chinese households would have their own recipe for this soup and every household will claim that theirs is the best. 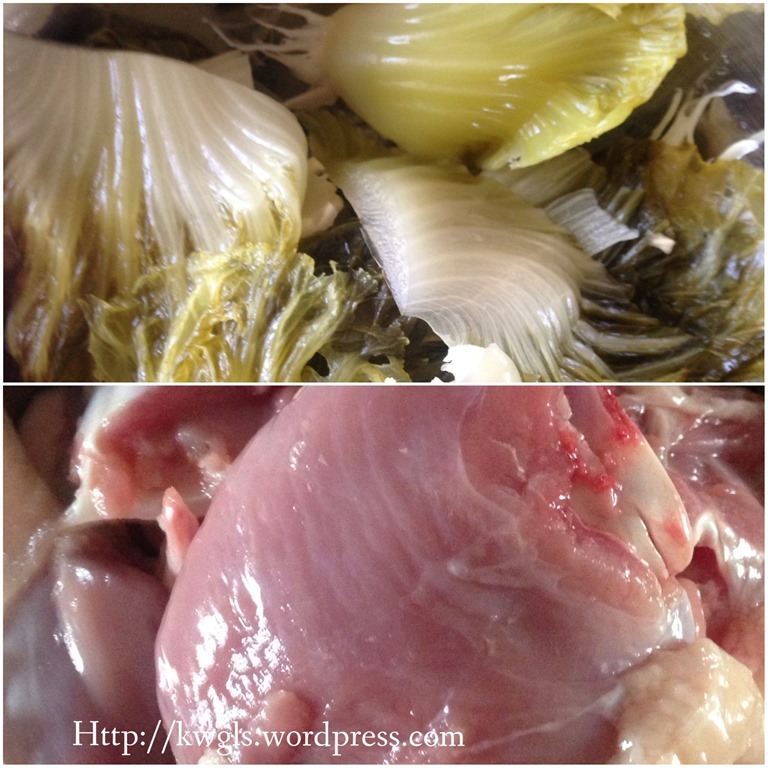 Though it is commonly thought of a Hokkien/Teochew/Peranakan (dialects) cuisines. however, to be more precise, it is a Fujian province soup and even in People’s Republic of China, they have recipe for this soup. When I was young, the soup were only prepared when they were big festivals or religious prayers. The main reasons were that ducks were relatively expensive and will only be served at big festivals. 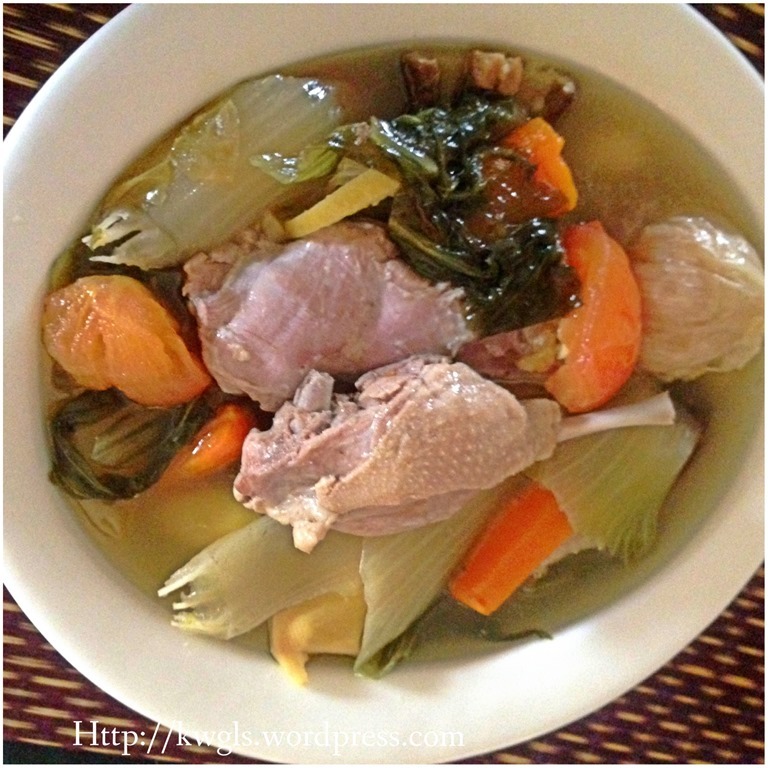 In addition, during religious festivals, lots of food were cooked and it is unlikely to finish all the foods in one day, this soup which is sour was less prone of turning bad if keep for a day or two as most households do not have refrigerators in the 1960’s. Thirdly, duck is very difficult to cook, traditional way will need braising of duck until the meat are soft and tender and the flavour of the salted vegetable starts to penetrate into the duck meat. Therefore, it is cooked only occasionally. 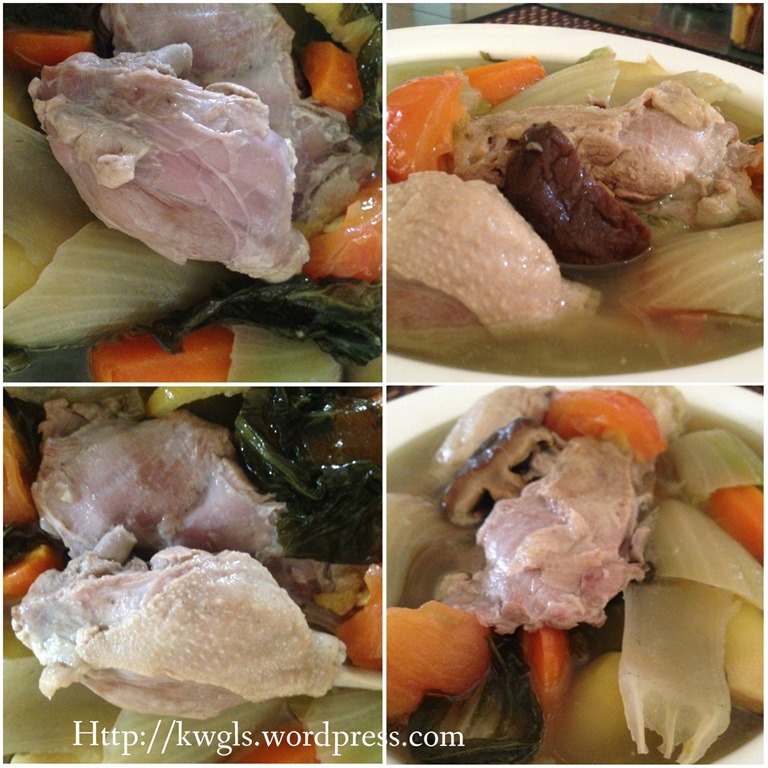 Traditionally, the duck meat were braised for hours before it can be served. It is also a common belief that the soup be left overnight to become even tastier. However, with the introduction of new cooking equipment, the cooking time have cut short considerably. I have used one hour to cook this dish and get the same taste that my mum would have prepared for at least half a day. For this illustration, I have used pressure cooker that cut short the time considerably. However, previously, I have also use rice cooker (soup function) to cook the soup and slow cooker to boil overnight. However, the best equipment is still the usage of pressure cooker followed by rice cooker and finally slow cooker. The most basic ingredients of this soup are ducks, salted vegetables, Chinese preserved sour plums and gingers. Ginger is a must because it will counter effect the cooling effect brought by the consumption of salted vegetables. Chinese generally discouraged consumption of preserved vegetables as it will introduce “wind” to the body. All other ingredients are side ingredients which in my humble opinion are optional. To make it even more sour, cooks are using tomatoes (which appeared to be an essential ingredient now), asam kulit (tamarind slices), vinegar, lemon and marinated lemon. Other more common ingredients are dried mushrooms, garlics and red carrots. There are also recipes in the internet that have chilli, brandy as their ingredients!!!!! For me, a good bowl of soup should be sweet (from the meat broth) and sour (not extremely sour) with a blend aroma of ginger and salted vegetables. Meat must be tender and soft. 1 kg of duck meat (about half a whole duck and de-skinned if preferred). 3 sour plums that can easily get from Chinese provision shops. Only the salted vegetables, duck, gingers and sour plum are the main ingredients. All other ingredients are side ingredients which are optional and a matter of personal preferences. Volume listed here are also for reference only as it is rather hard for you to get an exact 1 kg duck.. so full flexibility here. It is advisable that you soak the preserved vegetable first before you cook the soup. I would rather soaked the salted vegetable for a longer time to reduce the saltiness and if the final soup is not salty enough, I will add salt to the dish. I usually soak the vegetable for at least half an hour. Add 6-8 cups of water or about 1.5 times the height of your ingredients. Note: if you are using pressure cooker, you can use this amount of water. However, if you are using rice cooker or stove to boil the soup, you may need at least 10 cups of water until the meat get tender and soft. It is ok to start with this volume of water and if the volume of water is not enough, you can add water along the way. For pressure cooker, select “meat function” and it will took approximately 25-30 minutes. After cooking, let it rest in the pot for at least 15-30 minutes as it will continue to cook. BE CAREFUL WHEN HANDLING PRESSURE COOKER. For rice cooker, select “soup function” and if after the first cooking, the meat is still or tender, you can select another round of soup function and stop when the meat have your required tenderness. I usually cooked this before I went to bed and the next day, every thing is perfect. When done, add in the fresh tomato and close the lid and rest for another 10 minutes before serving. Preferably served hot with rice . 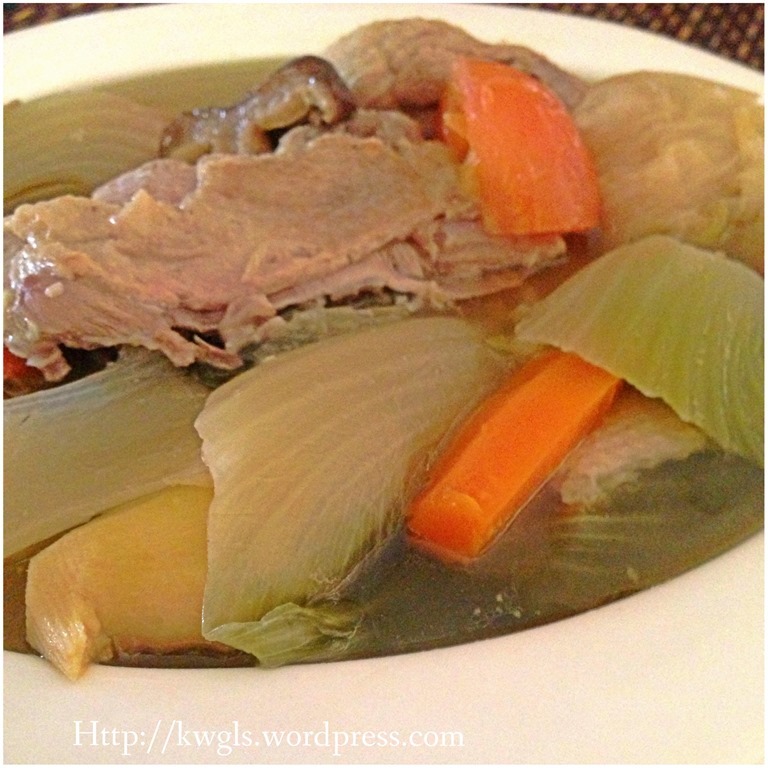 This is a rather short post on one of the traditional Chinese soup dishes – Salted Vegetable Duck Soup. The reasons for the exact combinations of these two main ingredients are unknown. Possibly duck needs time to braise and salted vegetable can withstand long hour of braising. Ginger is a must, in my humble opinion to get rid of the meat raw smell and also have to role of preventing gas formation when consuming preserved vegetables. Sour plum is the traditional ingredient to make this soup sour though the present method have resort to the use of tomatoes, lemons, tamarind slices and etc. All other ingredients are optional and quantity can varies according to your own preferences. Traditionally, the soup was cooked over charcoal stoves where you need at least 2 to 3 hours or longer to get the desire meat texture and soup flavour. However, with the pressure cooker as in this illustration, the cooking time have cut down considerably and it is easier to control the quality of the soup. 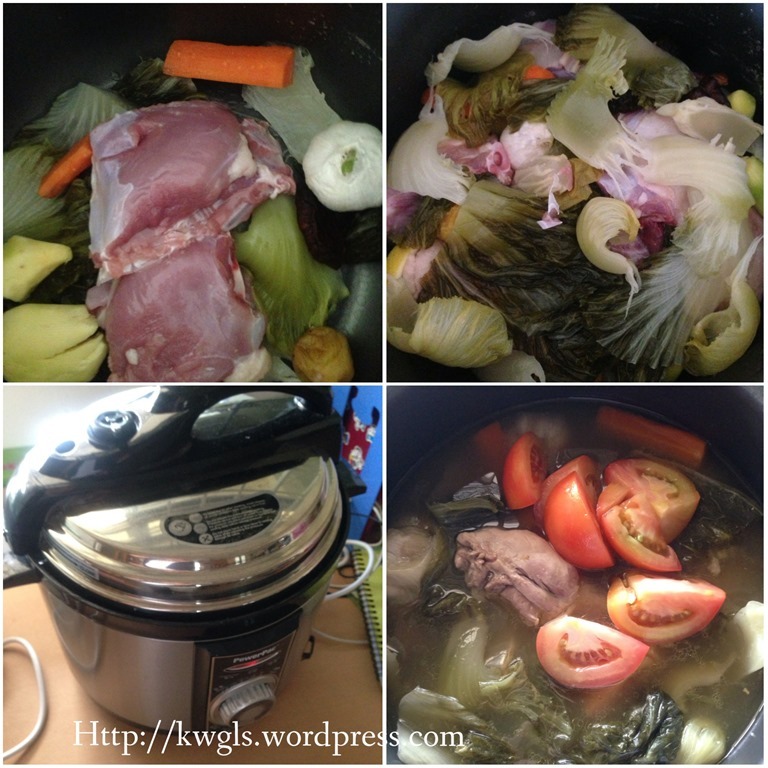 Rice cooker soup function is another alternatives than can be considered. While the soup is tasty and nice, excess consumption is not recommended as this soup is consider as cooling according to Traditional Chinese Medicine. In addition, those with stomach acidity will also need to watch out the volume of consumption. Hope you like it. It is not as difficult as what it is thought. It is a bowl of soup that I could never resists and you should be proud to modify the recipe to suit your families taste buds. Happy trying. Cheers. This entry was posted in Dish, Food Preparation Series and tagged 8, addition, aroma, belief, broth, CAREFUL, carrots, Cheers, china, CHINESE, combinations, CONCLUSION, consumption, cooker, cuisines, cups, Dialects, dish, dishes, DUCK, Easy, equipment, estimation, families, festivals, food, foods, formation, Fujian, garlics, ginger, gingers, Hokkien, Homecook meals, Hope, hour, hours, households, illustration, ingredient, ingredients, INTRODUCTION, layer, lemon, lemons, malaysia, Meat, Medicine, method, Mustard, Note, opinion, People, peranakan, plums, postaday, preferences, preparation, Prepare, PRESSURE, province, provision, QUICK, recipe, Recipes, reference, refrigerators, Republic, resort, rice, role, singapore, soup, Sour, STEPS, stove, tamarind, Teochew, texture, Though, tomatoes, Traditional, usage, vegetable, vegetables, Volume. Bookmark the permalink. 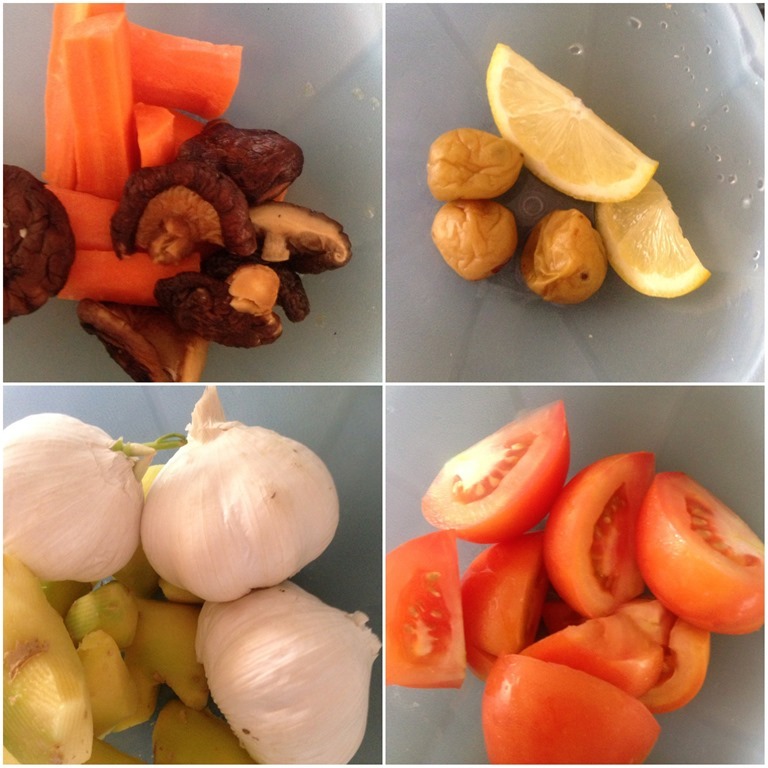 Do you just boil the soup with the whole garlic without removing the skin and peel? Usually, with skin. Wash first. As this is a stew process, you do not want the overcooked garlic to dirty your soup. The skin will help to prevent the garlic flesh from coming out.